If you have stairs in your home, the most common safety item installation are baby gates at the top and bottom of your stairs. BEWARE, you must also consider the safety to your stair banisters. 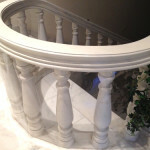 Stair banister can pose two different safety hazards, climbing over and/or fitting through the stair balusters. If your baby or toddler is able to climb on the stair balusters due to a ledge, decorative iron, horizontal rails or anything that can be climbed to get up and over the top rail, you have a “climbing over” hazard. You have a “fit through” hazard if your stair balusters are greater than three inches apart allowing your baby or toddler to fit through the slats and fall or become entrapped. Either hazard can cause serious injury or death. The most affordable option for each of these hazards is a thin sheet of safety plastic know as a Banister Shield. 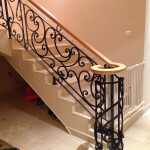 A properly installed banister shield can be an effective safety barrier without breaking the bank. It takes a bit of practice to make it look nice so we recommend hiring one of our baby proofing specialists to assist you. It is safer and more attractive than netting and can easily be removed when your child is old enough to understand the hazard. 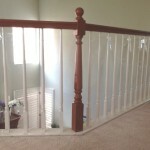 If you have a stair banister that needs baby proofing or for any other childproofing needs, please contact your local Baby Safe Homes babyproofing specialist. We are here to help make your home baby safe.